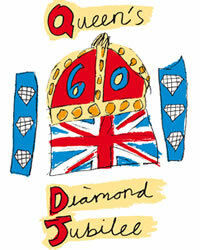 The Queen’s Diamond Jubilee in the UK for 2012 is being marked with an extra bank holiday on Tuesday 5th June. The Queen’s Diamond Jubilee Bank Holiday falls on Tuesday 5th June 2012 and is connected to the Spring Bank Holiday weekend where the 4th June is also a bank holiday so it is a a 4 day extended weekend (2, 3, 4, 5 June). There are lost of events and activities such as concerts, marches, parades and street parties organised to mark this special day for Great Britain which is why the extra days bank holiday was included for 2012 to help make 60 years of the Queens being the British monarch. The original late May Bank Holiday was moved back to the 4th June so the Jubilee bank holiday could take place along side it on Tuesday 5th June 2012.